Here are some of the powerful ways to prevent hair fall. Read More - Let's Talk AboutHair Removal – Beauty Standards Or Esthetics? How to do? Apply oil evenly on the scalp and massage gently with your fingers. Do not massage for more than 10 to 15 minutes. Leave on for an hour and wash thoroughly; you can also keep it overnight for better conditioning. For healthier and stronger hair, head massage at least once a week. Do not use conditioner after shampooing. Applying it means injecting chemicals into your scalp and hair. More chemicals will damage to your hair. Instead use a natural leave-in conditioner. Oils and plant butters make an excellent leave-in conditioner. Best oils to use – coconut, almond, olive, and jojoba oil; and best butters that work are – she a, kokum, or aloe butter. To use: Take a pea size amount oil or butter and rub it between your palms and apply to damaged hair avoiding the roots. This will strengthen your hair. Fine comb can hurt the delicate new growth and also cause injury on your scalp. Where as wide tooth wooden comb is gentler as compared to the plastic one. Wide tooth comb also provide massaging effect and help distribute natural oil from the scalp to hair. Read More - Which Is the Best Shampoo for Hair Loss? 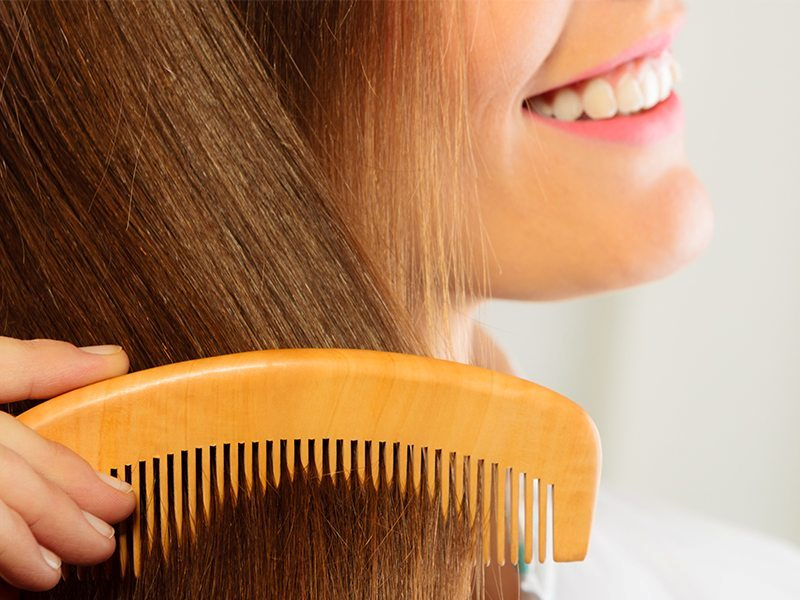 So if you want to avoid hair loss then discard the sharp tooth plastic comb, replace it with a wide tooth wooden comb and well-done if you have already done it. Exercise is another important solution to reduce hair fall. When you exercise you sweat and unclog the hair follicles, that gets clogged by dead skin or grease and give enough space for the new hair to grow. Exercising increases blood flow to your scalp. The increased blood flow brings with it oxygen and more nutrients, and thereby promoting healthy growth. How to do? So if you desire to avoid hair loss go for a walk, dance, cycle, play, run, do yoga, cardio or whatever you enjoy. Get up and get moving! Tight braids, ponytails or any other tight styles put pressure on roots of your hair and can lead to hair loss. If you make tight hair styles everyday your hair may stop growing permanently from some areas where it is pulled most from which results in causing a bald patch. Once in a while it is okay, but wearing tight styles every day causes hair fall. 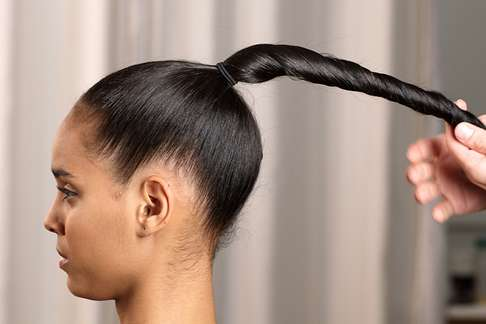 For everyday wear make lose braids or ponytails to keep hair under control but without damage. Amla is considered as a great hair tonic. Amla is antioxidant having high content of minerals, amino acids, vitamin C, falconoid and tannins. Eating fresh or dried amla helps in avoiding hair loss, graying, and promotes stronger and healthier hair growth. Due to its anti-inflammatory and anti-microbial effects, apply raw amla juice, powder or amla oil on your scalp which results in soothe irritated scalp and treat dandruff. How to do? Head massage amla juice with amla oil or coconut oil. You can also use amla powder as well. But the most effective option is to eat dried or fresh amla everyday. Take 1teaspoon amla powder with a glass of water every morning. It is one of the best detox drinks. Have you ever experienced your hair falling off like autumn leaves and turning grey overnight? The reason is excess worry or stress. Stress affects all of our body and hair. Other than eating healthy and exercising, you have to stay happy and relax. 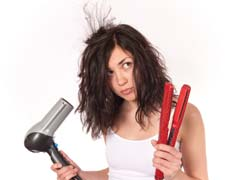 Never-ending stress can cause a large number of hairs to go into resting phase at the same time. This leads to clumps of hair coming out all at once. The good thing is that stress related hair loss is usually temporary, as long as the stress event is temporary What to do: For healthy hair, find time to relax. Engage yourself in stress busting activities like yoga, walking, relaxing, gardening, meditation. You can also talk to a friend, family or seek professional support. I have curly hair, but I always wished that my hair was straight. Perhaps, it is a human psyche to want what he/she doesn’t have. I considered rebonding many times, but never really did it. And thank God I didn’t. I have used straightener, heat brush and blow dryer few times. But whenever I used them, I felt these hot appliances did more harm, so I have stopped using them. Chemical treatments, use of heat appliances and wild styling can actually affect the hair roots and damage your hair. So stay away from them as far as possible. Herbal hair oils have been an integral part of hair care in our traditions. Oil infused with herbs such as amla, brahmi, hibiscus, rosemary, lavender contain tons of polyphenols, antioxidants, bhringraj, phytosterols, fatty acids, marigold, vitamins, and minerals that keep the scalp healthy and promote hair growth. These oils also offer anti-inflammatory, anti-reddening and anti-fungal properties that help to keep healthy and dandruff free scalp. The mentioned solutions may take weeks or months to show desired results. For immediate hair growth, hair transplant is only the solution. Saima Sharif is a passionate content writer. My major interest is writing content on topics such as Best Hair Transplant, hair solution, home remedies for hair problems or any treatment related to this. My current adventure is myhairclinic (Pakistan oslo and London).